Football (soccer) is the number one sport in Ghana. But basketball has been growing in popularity every year. Our basketball coaching volunteers in Ghana work with local organizations that organize leagues, camps, tournaments, and coaching clinics in Accra, Cape Coast and the Volta Region. The basketball players include both boys and girls and range in age from 6-18. This volunteer position requires a self-starter and good administrator who has an abiding interest in basketball, either as a current or former player, coach, official or manager. You can come by yourself or with teammates and coaches from team back home. your high school or university team to participate as coaches and counselors to the campers. Daily activities at the camps include fitness training, fundamental skills training, video sessions, guest speakers, daily trivia session, scrimmages, and skills challenges. 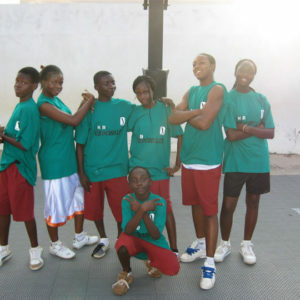 The Ghana basketball volunteer program is a part-time volunteer position. Volunteers typically split time between volunteering with the basketball program and volunteering in another field such as at school or medical clinic. 2. Project Dates: Year-Round. Choose any date to arrive.